ABSTRACT: The rise of autonomy, development of the fully autonomous vehicle, and the burgeoning service economy unlock opportunity to drive the automotive ecosystem into a new age of “NextGen mobility” where service- and utilization-based models dominate, while traditional ownership diminishes. 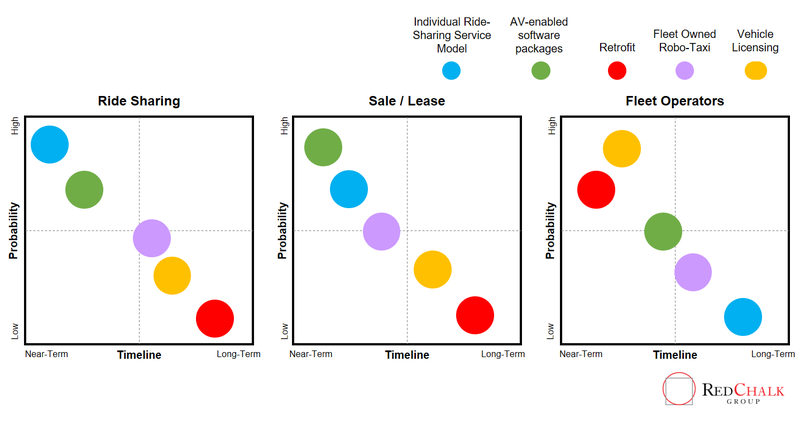 Lower ownership rates present both risk and opportunity for both automotive incumbents and service-based new entrants, and these players’ ability to adapt strategies will define the future mobility landscape. We consider potential business models and how mobility players can evolve. Adapting to changing customer needs and offering models to address evolving market opportunities will be critical to success within the NextGen mobility landscape. The rise of the service economy has driven an evolution of business models across industries, including the automotive industry. Development of autonomous vehicles (AV) in conjunction with the service based economy can be transformative, ushering a new age of “NextGen mobility”, where ownership of assets is valued less and convenience and user experience will drive the business model evolution. This transition to NextGen mobility is at a nascent stage, but notable examples exist in the progression in ride-sharing mobility models like Uber, which evolved from taxi services by removing customers’ biggest pain point: hailing a vehicle. The seamless user experience of ride-hailing apps has driven rapid growth with these services, and development of fully autonomous cars will unlock additional service based models. 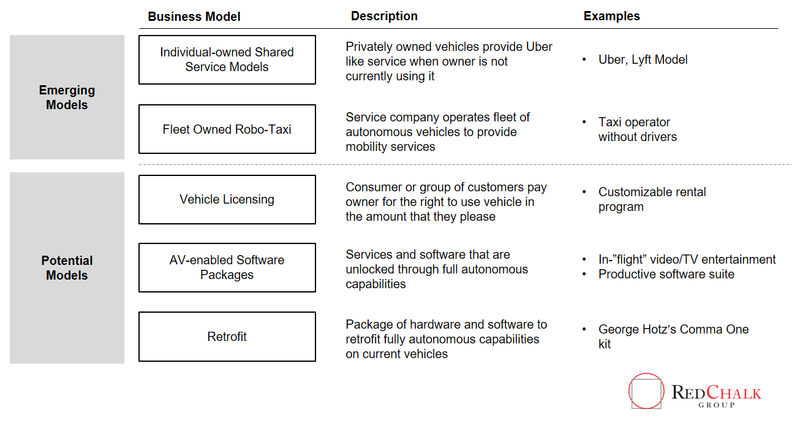 While many of these models have yet to emerge in the market, we outline hypothetical new services by considering convenience and pain points for current mobility options (See Exhibit 1). When considering the effects of full autonomous vehicle technology, the transformation from active driver to passive rider unlocks the possibilities of comprehensive mobility service-based offerings rather than product sales. Success of current ride-sharing services like Uber and Lyft are restricted by driver acquisition and retention, but full AV capabilities eliminate this restriction and crowd sourced fleets can operate whenever individual owners can commit their vehicles to the shared pool. This evolution would increase utilization of idle vehicles and alter consumer perception of vehicles from a usable asset to an income generating investment. If AV technology pushes consumers to lower private ownership rates as some have hypothesized, increased demand for fleet operated service models allow for more novel business model possibilities. Deployment of AV technology presents an opportunity for fleet based operations and management services, as vehicle operations can be monitored closely and operate more safely. A fleet of autonomous vehicles can be marketed to customers in a number of different ways based on the frequency of consumer’s need and length of average trip. Moreover, the AV fleet can operate as a taxi service providing on-demand ride services, effectively competing with current-state Uber models. For a consumer who needs regular access to a vehicle (e.g., work commuters), a vehicle licensing model where a customer pays for the right to utilize a vehicle when needed could be compelling. A licensing model can be managed efficiently through use of a fleet since advanced software can be developed to monitor and optimize the fleet, and accommodate complex ownership / licensing structures. Development of an AV fleet is cost prohibitive in many situations and the long average life of current vehicles may cause slow adoption and penetration of AV capabilities. A potential solution to this issue is a hardware/software package to retrofit semi- or full-autonomous capabilities onto existing fleets. While this has obvious potential difficulties and liabilities, as seen with George Hotz’s comma.ai venture, the cost advantage of a retrofit package presents significant opportunity for a player that can develop a safe and effective way of scaling the retrofit process and subsequently commercialize the product. Current automotive players must consider their current business models and how they can translate and evolve towards the possible models in the age of NextGen mobility (See Exhibit 2). The shifting ecosystem of mobility participants and the continued push to full autonomy has attracted innovation dollars by some automotive incumbents (Ford AV shared mobility), but participants across the mobility landscape need to begin considering the future and its implications on business and operating models (See Exhibit 3). While OEMs possess the technical expertise of developing safe and efficient vehicles at scale, transactional sales have traditionally been their dominant revenue model. With NextGen mobility potentially driving consumers away from private vehicle ownership, OEMs must adapt to retain their competitive position by investing in the assets and capabilities to support NextGen models. Some OEMs have formed partnerships to break into shared mobility services (e.g., Volvo-Uber, GM-Lyft) and combine the opportunities of ride-sharing and autonomous cars. Once OEMs develop the technology for full AV, their mass production capabilities give them the ability to build a fleet quickly and efficiently and develop a robo-taxi service, like Ford, or a licensing model. This would be a capital-intensive operation but OEMs can form partnerships with fleet management operators to take advantage of their comparative expertise. In the age of NextGen mobility, mobilizing and tracking large fleets of vehicles is crucial, and fleet operators’ experience in this domain affords them a complementary advantage. Fleet operators (e.g., rental car companies) have the ability to optimize vehicle utilization to capitalize on real-time demand, a critical skill that represents the foundation for NextGen mobility models. The retrofit model is advantageous for rental companies and other fleet operators who own large fleets, which may make buying a fully autonomous fleet cost-prohibitive. Operators who adopt AV fleets can shift business models to cater to consumers’ shifting needs. For example, consumers who require regular access to a vehicle but do not own one, a licensing model could bridge supply and demand. An AV fleet can unlock the ability to provide this service, and there are various potential revenue models for licensing agreements. The operator, such as a rental fleet, can offer exclusive rights to a vehicle for a person (or group of persons) who pay a weekly rate on a per-mileage basis. Dynamic pricing models form the basis of non-exclusive models where consumers pay premiums for peak demand hours or locations. The many permutations of usage-based models enable innovative business model evolution by fleet operators in the age of NextGen mobility. Ride sharing models have significant opportunity but also experience potential risk given the future development of AV technology. Full autonomy allows owners to utilize their vehicles more efficiently, sending their vehicle on ride-sharing trips when not in use. This provides ride-sharing operators access to more vehicles and can be a solution to a core problem of driver acquisition and retention. However, if AV development shifts customer perception and drives lower private ownership rates, ride-sharing operators may need to adapt to fleet ownership to ensure a sufficient supply of vehicles for efficient operation and serving customer needs. Regardless of go-to-market strategy, development of full AV capabilities transforms drivers into passive passengers enjoying the ride, and this unlocked free time entails significant “white space” opportunity. Entertainment packages and other software offerings unlocked by full AV technology can be integrated directly into the operating system interface. Examples of audio entertainment integrated into vehicle systems can be seen today (e.g., Tesla-Spotify, Pandora-Various OEMs), and full AV can extend this to video entertainment (Netflix, TV) or productivity suites (Microsoft, Apple). Seamless integration and ease of use will be important for unlocking these features’ potential, and an app store style of design and selling may facilitate this integration. As drivers become less involved in the operation of the vehicle, entertaining passengers will become an increasingly important aspect of product differentiation, with impact across multiple industries/ value chains. 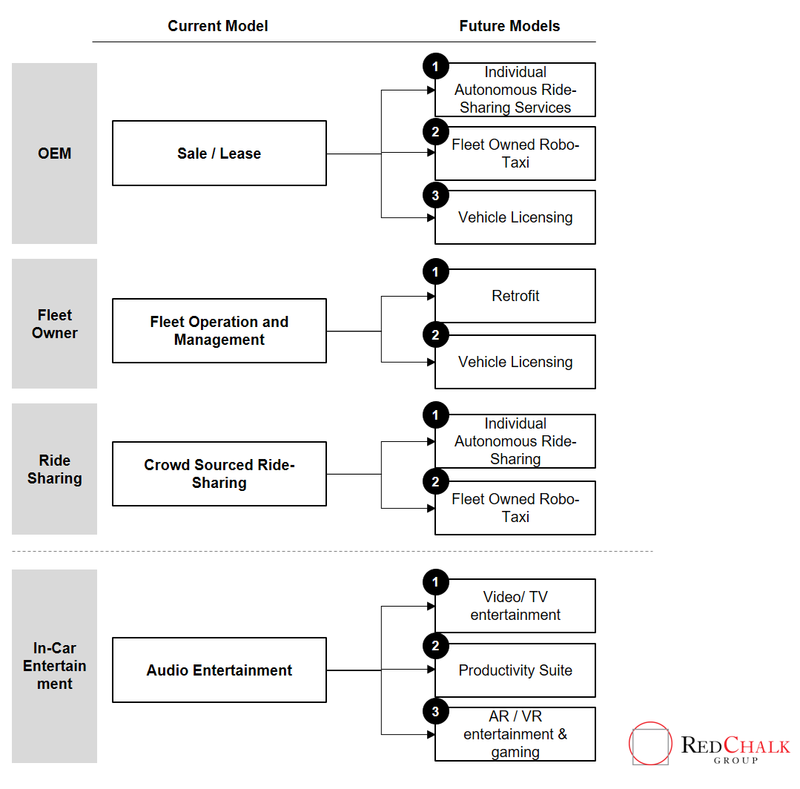 Utilizing these new AV service models, how will in-ride infotainment and media be delivered to the customer, and how can connected car players carve out a stake in this white space opportunity? Lower vehicle ownership rates threaten the core business models of automotive incumbents, as well the Uber / Lyft model. How can these players adapt to position themselves to benefit from the shifting landscape of NextGen mobility? Deployment of an AV fleet is a capital-intensive investment. How can smaller players establish compelling partnerships that diminish the need for capital and mitigate the risk that AV deployment poses?